Pedha—a Traditional Indian Sweet | Can't Believe It's Allergy Free! No Indian festival feast is complete without a plateful –:thaali” of pedhas. Of course pedhas are wheat and gluten free, but most store bought pedhas are heavily garnished with nuts. When they are made without nuts, there is still a very high risk of cross contamination as nuts are such an integral part of Indian sweets– ‘mitthai’ makers facilities process nuts all the time. For anyone with allergies, home made pedhas are the safest. This simple recipe is so easy to make and so delicious! 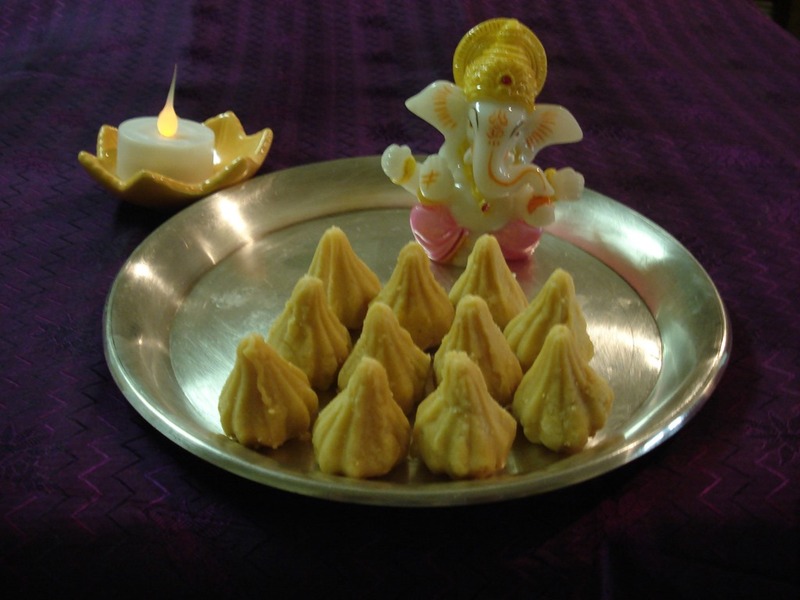 These pedhas are ‘modak’ shaped, specially created for the on going Ganesh Chaturthi festival. In a small saucepan, lightly roast the saffron threads. Alternately warm saffron in microwave for about 20 seconds or till threads become a little brittle. Crush brittle saffron threads between fingers and place in a small bowl. Add 2 teaspoons of hot water to crushed saffron. Set aside. After a while, color, flavor and aroma will get deeply enriched. Place butter in non stick wok or large non stick pan, on medium heat The process of stirring is easier in non stick equipment. When butter has just melted, pour cream and give a stir. Mix in sugar, then gradually add the dry milk powder, stirring constantly. Stir well on medium low heat for about 10 minutes. Stirring time depends largely on quality of milk powder. Some brands of milk powder thicken faster than others. Add cardamom powder and saffron- water mixture. Stir till well mixed. The mixture should not be so thick that it leaves the sides of the pan. It should be soft and should be the consistency of thick cake batter or very soft dough. When cool enough to handle, but not really cold, shape into round slightly flattened pedhas, or place into modak molds.